Be the first to share your favorite memory, photo or story of Virginia "Ginny". This memorial page is dedicated for family, friends and future generations to celebrate the life of their loved one. 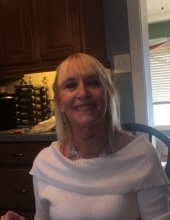 Virginia “Ginny” C. Darby (nee Fickenscher), age 63, passed away on January 23, 2019 at her home in National Park where she lived since 1976. Ginny worked as a Customer Service Associate for Wawa in Thorofare. Ginny’s biggest joy was being with her children and grandchildren and having family get togethers. She also had a great love of animals. Survived by her husband of 41 years Donald W., children Ginny, Denise, Donald C. (Lori), John (Shannon), grandchildren Matthew, Samantha, Kyle, Carly, Kayla, Kain, Johnny, Kelsie, great granddaughter Adeline and sister Sally Lowell. Friends may greet the family on Monday after 9:30am in the Budd Funeral Home, 522 Salem Ave.(Kings Hwy), Woodbury, NJ. Funeral service will be at 11am. Interment Bethel Cemetery. Memories may be shared at www.buddfuneralhome.com. To send flowers or a remembrance gift to the family of Virginia "Ginny" C. Darby, please visit our Tribute Store. "Email Address" would like to share the life celebration of Virginia "Ginny" C. Darby. Click on the "link" to go to share a favorite memory or leave a condolence message for the family.